Visionary storyteller Jodorowsky returns to the epic mythology he created with the late M�bius over 30 years ago. This volume concludes the piritual space adventures of everyman, John DiFool, as the universe faces the threat of an all-devouring metallic virus. 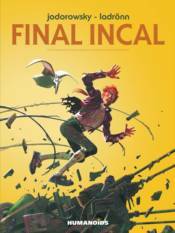 This regular sized hardcover contains the complete 3-volume series Final Incal illustrated by Eisner-winning artist Ladr�nn as well as an interview with both creators. Note: This edition does not include M�bius's After the Incal material.